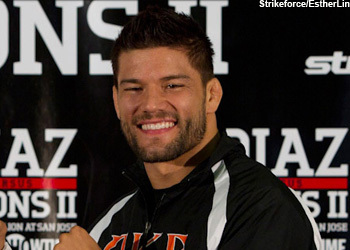 With a victory over Benson Henderson on Saturday at UFC on FOX 10, Josh Thomson (pictured) is right back where he was prior to getting assigned to Henderson – first crack at UFC lightweight champion Anthony Pettis. UFC president Dana White made the announcement Thursday in Chicago. Henderson, the man Pettis dethroned in August to capture the crown, wasn’t granted the same incentive. Thomson was initially slated to challenge Pettis for his hardware at UFC on FOX 9, but Pettis was forced to withdraw from the December shootout to undergo knee surgery. Pettis is hoping to return for the UFC’s big Fourth of July weekend show in Las Vegas. Thomson has alternated between wins and losses over his past five scraps. “The Punk” was most recently seen in April posting a TKO victory over former top contender Nate Diaz in his return to the Octagon. Thomson enters Saturday’s scrap as more than a 2-1 underdog to send Henderson on the first two-fight skid of his career. The 155-pound affair headlines UFC on FOX 10, which takes place inside United Center in Chicago, Illinois.